A premiership team. 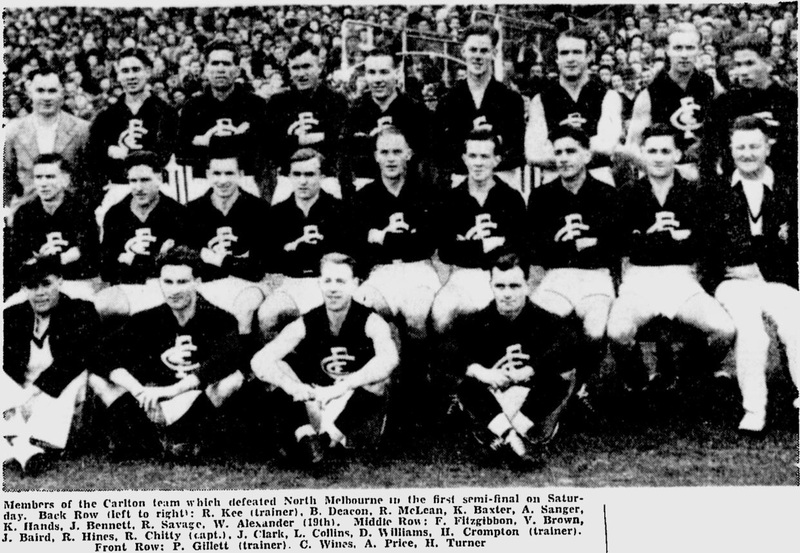 This is the 1945 Carlton (VFL seniors) team photographed at Princes Park before either the semi-final or preliminary final of that year. Carlton were on the way to their victorious ‘Bloodbath’ Grand Final against South Melbourne. With the MCG still occupied by the military, Princes Park, Carlton’s home ground, was the venue of all VFL finals in 1945. White shorts. Big crowd. Bad emulsion damage along bottom of the photo obscures face of one player in front row. 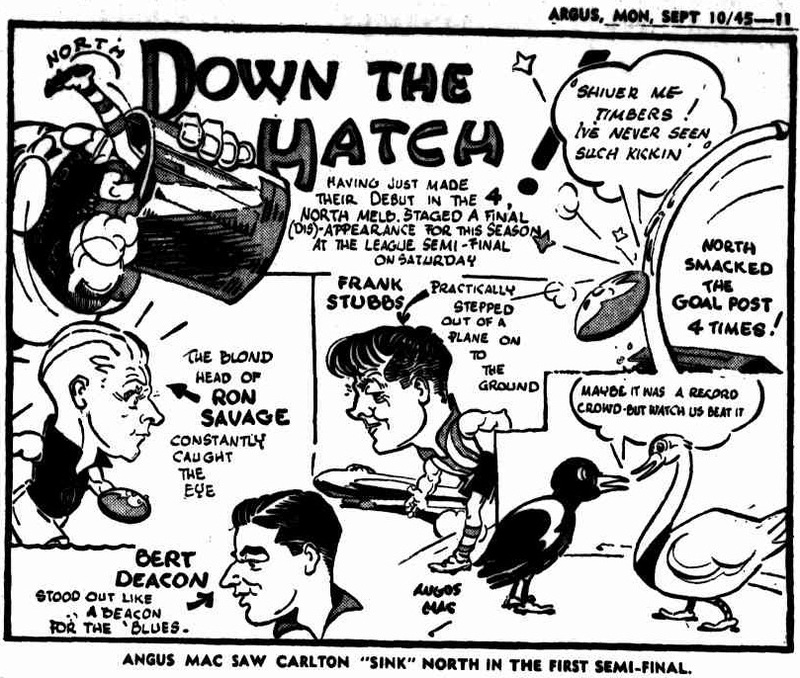 Fitzgibbon, Hines and Alexander lost their places (to A.Way, C.McInnes and J.Mooring) when the Grand Final team was named. Collins (ex-Coburg champion) kicked eight goals in one 1945 final and four in another. Two of the players seen here, Ron Savage and Albert ‘Mick’ Price, are seen in numerous other Boyles photos of Carlton teams. Price, a member of Carlton Seconds teams of the thirties and later coach of Carlton Seconds teams of the fifties, played 102 senior games for the Blues 1936-46 as rover and forward-pocket and was a member of the 1938 and 1945 flag sides. Savage, a ruckman seen in (Boyles) photos of Carlton Seconds teams, played 111 senior games 1938-45. He won Carlton’s best and fairest award in 1945 but ironically received an eight-week suspension following the ‘Bloodbath’ Grand Final. This photo is reproduced (with player identifications) in G.Handley, The Great Grand Finals, Walshe Publishing (Geelong), 1989, p. 47. A different photo from the same match appeared in the Age Newspaper, with the names of all players and trainers. Japan surrendered on 2nd September 1945 finally ending WW2. Less than a week later people were still celebrating the end of many years of war. Although Japan formally surrendered on September 2nd, many outposts with hundreds of thousands of men surrendered over the next few weeks.